Residents of the Federal Capital Territory (FCT) noted that as of Thursday, it wasn’t clear what was being constructed when they began, but afterwards, it turned out to be the broom symbol of the All Progressives Congress. “WORLD LARGEST BROOM Attention: @GWR This is the Largest Broom anybody or group has ever [erected] anywhere in the world. This is work of some group of volunteers of @OfficialAPCNg . It deserves your recognition and honour. 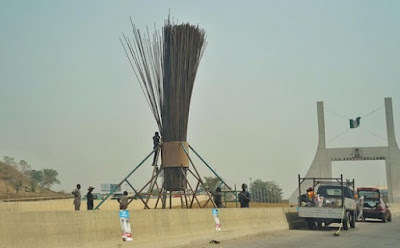 Quiz: How much did it cost APC to erect that ugly broom at City Gate in Abuja? APC is beginning to scare me. Why are they erecting a massive broom in front of Abuja's gate? That broom makes ZERO sense to Abuja’s gate and adds ZERO value to APC’s re-election bid.